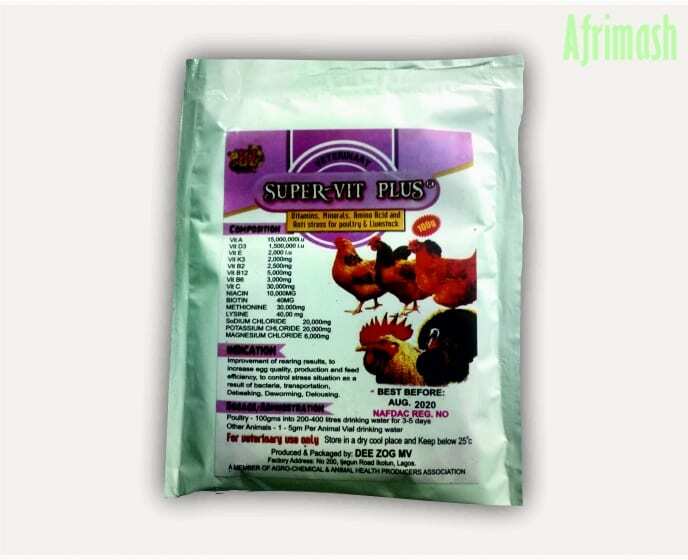 Super-Vit Plus is a special feed supplement which contains vitamins, minerals, amino acids proven to help control stress conditions in poultry and livestock. SuperVit is recommended for the improvement of rearing results, to increase egg quality, production and feed efficiency, to control stress situation which might arise as a result of bacterial infection, transportation, debeaking, deworming, delousing and other management operations. Other Animals: 1-5 g per animal via drinking water. We have over 20 years experience in providing the best quality poultry farm input to the market at competitive prices. So, you can be guaranteed of getting good quality products at competitive prices from us. We do our due diligence to ensure every customer is satisfied. We guarantee you of "zero risk purchase" experience in our shop. We do our best to ensure every customer is very satisfied by our products. We ensure you get exactly what you order for and also make sure you get your items in time. We accept returns if you send us a message within 24 hours of receiving our products. If your message comes later than 24 hours, we would have to strike a bargain.